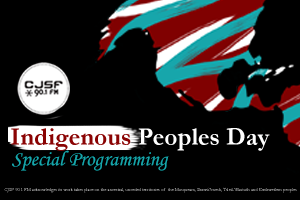 National Indigenous Peoples Day is this June 21, and CJSF will be broadcasting special programming to mark the occasion! Tune in next week to hear content highlighting the diverse perspectives and communities of Canada's Indigenous peoples, as well as special Indigenous Peoples Day episodes of your favourite CJSF programs including Speak Up!, SFU Ideas & Issues, The Arts Show and others. - Special Spoken Word/Talk programming for each episode of Speak Up! For more information on our special programming, drop our Programming Coordinator Robin Eriksson at cjsfprog@sfu.ca, or contact our Public Affairs and Talk Coordinator Jesse Wentzloff at cjsfpa@sfu.ca.